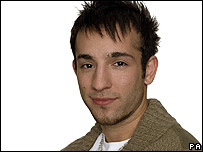 Big Brother 7 contestant Shahbaz Chauhdry has walked out of the Channel 4 television show. The 37-year-old Glaswegian was being watched by show psychologists after threatening to kill himself during his five days in the house. "I am a dead man walking. This is my last curtain call," he told housemates. In a statement Channel 4 said: "He was unhappy and finding it increasingly difficult to integrate within the group dynamic of this year's housemates." 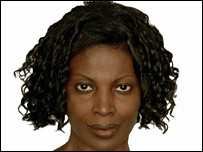 The broadcaster stressed that the welfare of the 14 Big Brother participants was "of the utmost importance". Daniel Sokol, a medical ethicist at Imperial College, London, has criticised the programme's treatment of Shahbaz. "Quite early on he went to the diary room and said he wanted to leave, but Big Brother said 'no'." "That doesn't seem very ethical to me," he said. "Had Shahbaz been able to leave at first opportunity, he wouldn't have been on suicide watch". The Mental Health Foundation had earlier written to Channel 4 asking what welfare measures were in place to protect contestants. "It is disappointing that Channel 4 appears to be exploiting vulnerable individuals to make a television show," wrote the charity's chief executive Andrew McCulloch. The show's producers said they had not yet seen the letter, but that all contestants had been "intensively screened by professionals" before entering the house. Psychologists are also available during the show's run to discuss any concerns that could not be resolved, they added. However, Daniel Sokol said Shahbaz's exit "raises concerns over the programme's methods of psychological assessment". "I wonder how much the psychologists are actually informed about who the other participants are going to be and the situations they're going to be put through," he said. "Unless Big Brother explicitly says 'this is what we're planning to do', you can't do a proper assessment." Shahbaz infuriated other contestants with his theatrics, hiding food at night, being insulting and repeatedly crying. He has been unemployed for 21 years and says he likes knitting and singer Kylie Minogue. 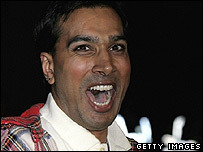 Fellow contestant Dawn described Shahbaz as "a parody of John Inman and Mrs Doubtfire". She told him to leave the house if he could not learn to get along with everybody else. "If you can't handle it and you don't know how people feel, you should bow out gracefully," she said. "You should know better and if you don't know better and you truly are this anti-social, as my bosses would say to me - you know where the door is." Dawn said Shahbaz was "a parody of John Inman and Mrs Doubtfire"
Housemate Lea added that Shahbaz was "obnoxious to people who are younger than him" and did not show people "the respect they deserve". 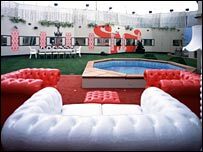 This year's Big Brother began on Thursday and has an "inside out" theme, with sofas in the garden and grass indoors. The house is smaller than in previous years, with greater use of mirrors and glass to give contestants as little privacy as possible. Campaigners have accused Channel 4 of exploiting contestant Pete Bennett, who has Tourette Syndrome. The programme's producers have insisted the 24-year-old is confident and creative and was picked on personality alone.